When Sen. Joni Ernst (R-Iowa) delivered the Republican party's response to President Barack Obama's State of the Union Address Tuesday night, she touted her down-home roots growing up on her family's farm in southwestern Iowa. What she didn't mention is the video that made her famous for enthusiastically, unabashedly castrating pigs. 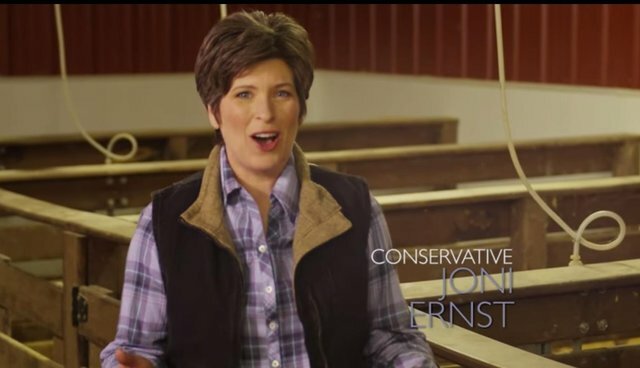 Ernst rocketed to the top of a crowded Senate race last March when she released a campaign ad equating her experience castrating hogs as a child with the political wherewithal to cut pork spending in Washington - promising to "make 'em squeal!" The unlikely candidate's farm girl background catapulted her into the U.S. Senate, where Sen. Lindsey Graham (R-S.C.) welcomed her with a plaque bearing a pig castration tool. On Tuesday night, as The Hill pointed out, "Ernst presented a more family-friendly version now that she's an incumbent senator." Surgical pig castration is standard practice in the U.S. meat industry. It is often done without anesthesia but doesn't have to be inhumane: Immunocastration, a process that involves injecting a protein compound to prevent hormone production, prevents the need for painful live castration. It's commonly used in many countries - but, as Ernst can surely attest, it's far rarer in the U.S.